Check out that pancake. See those purple bluish specks? Haha, can you tell what they are? If you say blueberries, you’re half right. You can’t be sure, when eating these pancakes because they’re just so good! 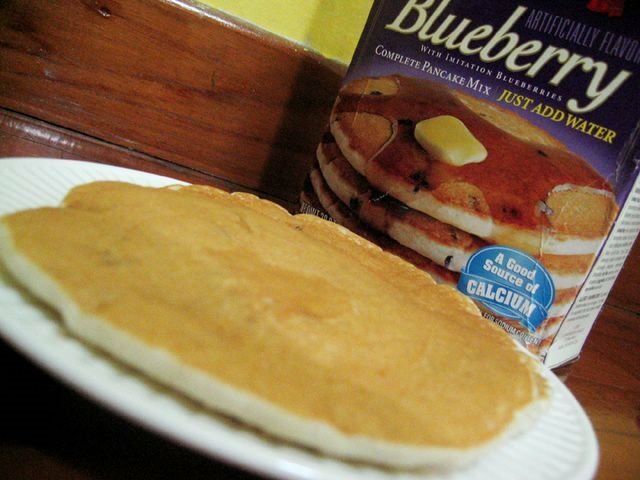 They sure taste very much like blueberry pancakes BUT, truth is, they are no blueberries in it. 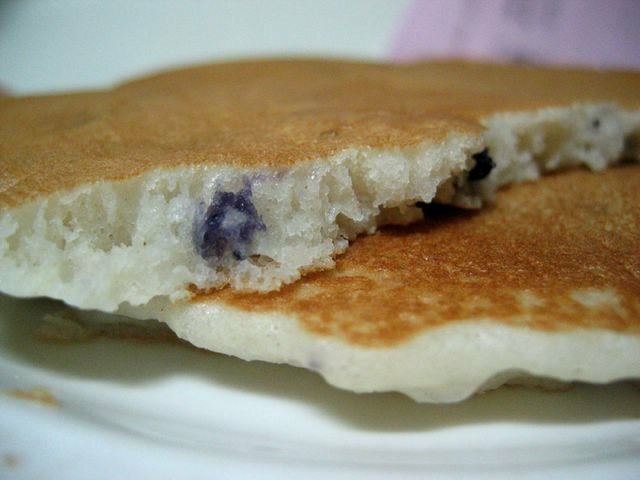 These pancakes are made from the Krusteaz Blueberry Pancake mix that Darla of Messy Cucina sent me in her Blogging by Mail Four package and they use artificial flavours to mimic the taste and look of blueberries. I don’t think they have it here in Singapore though. But i wish they do! Real blueberries here are just so expensive! Krusteaz is a miracle I tell ya. All you have to do is add water, mix it and cook it on a griddle or frying pan. It’s really a breeze to cook these for breakfast. It seriously takes only minutes! My brother loves these and so do my sister. They keep asking me to cook it for them… and that means the stash I have is depleting soon. Ahhhhh… anyone knows if I can get them here? Or better yet, can you recommend the best pancake mix you’ve ever tried? Thanks! Okies, I have only two exam papers left. One’s tomorrow morning and the other one, next thursday. Am so looking forward to celebrating, after! Might just bake me a HUGE cake. . . The post-exam celebratory cake! But first I need a kickass recipe! You have one? Tell me! Share the love…. 🙂 k cheerios for now…. Oh gotta be Pillsbury for me! Can get it at Cold Storage, soooo easy to whip up too, and very fluffy! I Love it!! Hi, love reading your blog… all tt fd just looks so gd… =) anyways I saw the krusteaz blueberry muffin mix at cold storage @ katong mall… now sure if you would be interested but tot I’d just let u know since its of the same brand and it has blueberries! Krusteaz also makes an excellent fat free orange cranberry muffin mix- it is delicious!